What is it? The Suica is a prepaid e-money card for moving around and shopping. There is no more need to buy a ticket from a vending machine. Just touch your Suica to the ticket gate and the fare is automatically deducted from your Suica. The Suica can be used not only for JR East trains, but subways and buses as well. 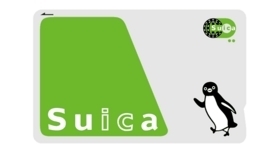 See the Suica Map for transportation systems you can use with the Suica. The Suica can also be used to pay for things with e-money. Buy soft drinks and coffee from vending machines and on the train. Even buy a newspaper at the station kiosk without fiddling for coins. For traveling in Japan, the Suica makes a more pleasant trip.